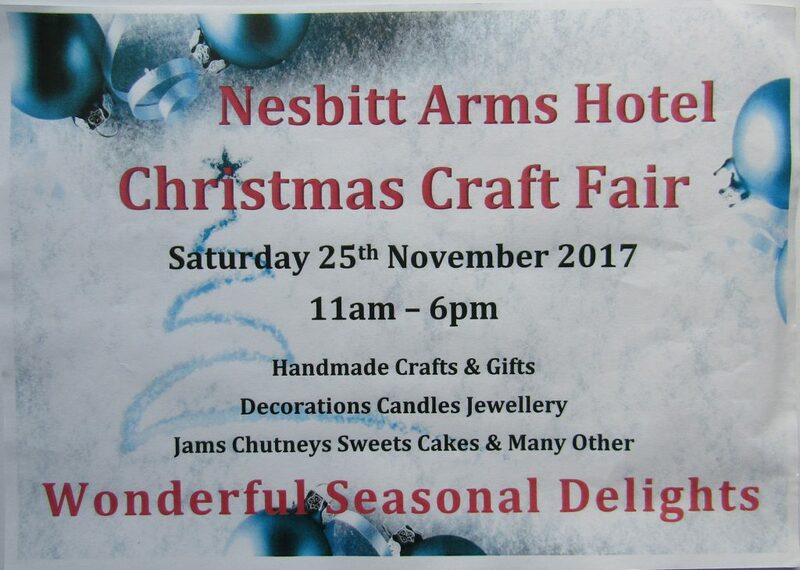 This years’ Christmas craft fair takes place in the Nesbitt Arms Hotel on Saturday 25th November, 2017. Join us for a host of over 30 festive stalls under one roof. The range is dazzling; everything from home-baking and gluten free baking to hand-made jewellery, Christmas decorations to hand weaving products, chocolates to painted pots and glass, natural beauty and cosmetic products, flower setting, candles, jams and wood crafts. Come along and support our local crafters. Entrance is free, and you can pick up a glass of alcohol-free mulled juice, or mulled wine at the door. Pop along during the day from 11am to 6pm. If you would like to book a stall for the fair, contact Clare Molloy on 087-284 2012.